If there's one thing I try to express in all my discussions about canning, it's safety. A couple of days ago I received an email that epitomized these concerns. I didn't ask permission to post the email so I won't, but I'll synopsize the contents. It seems a gentleman and his wife, evidently in a happy and experimental mood, were canning crabapple jelly. They said they were new to canning and were clearly having a good time together, learning how to preserve... which is the wonderful part. They had lots of crabapple juice left over, so they decided to experiment and add all kinds of different stuff such as peppers and "et cetera" (I don't know what else they added besides peppers). In a "what the heck" mood, the husband pulled out a pack of bacon to add to the jam, hoping to have bacon-crabapple jam. Taste sensation aside, the plan was to cook the bacon "til just about crispy," keep the bacon fat, pour the bacon fat into the juice, and add a couple of chunks of bacon to the juice, seal it up, and let it set. I'm very very very glad this gentleman heeded his wife's concerns that such a combination might not work... not because I think bacon-crabapple jam sounds disgusting, but because it's a dangerous thing for novice canners to willy-hilly throw together a bunch of ingredients without considering how those ingredients can drastically affect processing times and requirements. I emailed the fellow back and said that canning fats isn't recommended, and that ALL meats must be pressure-canned at 10 lbs pressure (adjusted for elevation) for 75 minutes (pints) or 90 minutes (quarts). I also sent him a complimentary copy of my ebook Canning FAQs with particular emphasis on the tips about what NOT to can and how beginning canners should stick with pre-approved canning recipes. I also urged them to get a good canning reference book such as Ball Blue Book or Putting Food By, which gives detailed canning instructions and processing times. 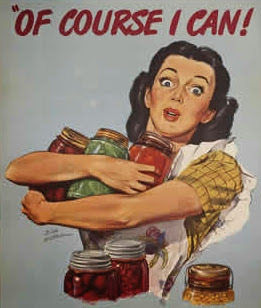 I am relieved this couple sought outside advice before embarking on what could have been a risky canning adventure, since as it turned out they didn't have a pressure canner. 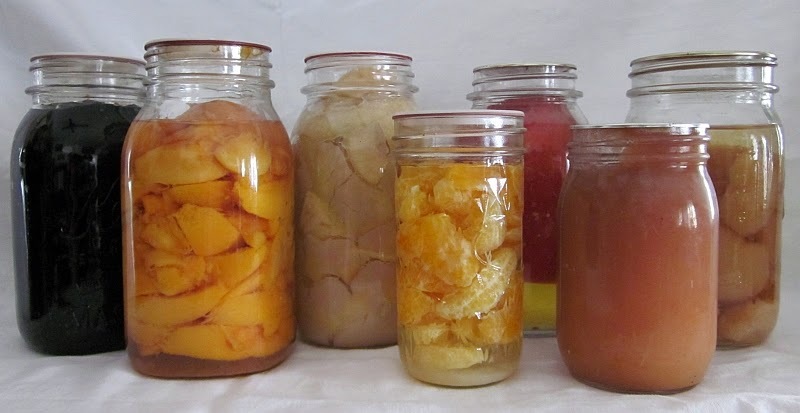 While I urge everyone to give canning a try -- I am convinced it is a second-to-none method of food preservation -- I also urge canners to embrace SAFE canning techniques, and to take the time to learn the proper methods. First off...good on the husband for breaking the 'men don't stop for directions' stereotypes. Second, not that you need my confirmation, but there aren't two better references than the Ball Book and Putting Food By for folks that I looking to get into food preservation. That was too close for comfort! Betcha that's a lesson the couple won't need twice. Good for them for venturing into canning, and bless them for having the wisdom to be in touch with you. It's just soooo easy to get into a jackpot. A good example would be the neighbor to whom I gave a quart of fresh chicken stock, telling him clearly it wasn't canned or sealed, but fresh and needed to be refrigerated and used right away. Because I'd put the lid on while the broth was still hot, it sealed a little, and he decided it must be OK to save on the shelf. Good grief. Needless to say, NOW anything like that goes out of my kitchen like that goes with a clear, written label and instructions for safe use and safe keeping.....and it's TAPED onto the container. Thanks for sharing this timely story, Patrice. After purchasing our pressure canner and much success at canning fish,we decided to try something different. We bought some chicken thighs, cooked them off cleaned off the skin and skimmed off as much of the fat as we could. Not enough. While everything sealed well the result was disgusting,very intense greasy flavour. Yuck. The dog however was delighted. A few days ago, I was in a really fun mixed-group conversation about canning. Everyone had a story to tell about what they had been "putting by" this season from their garden. We all took turns bragging about our bread and butter pickles, dilly beans and relishes. I'm so glad this couple is getting into the spirit and am so glad they checked with you! 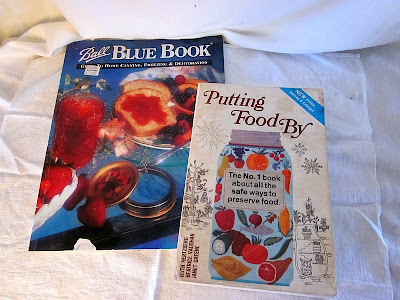 It's through this blog, and the Blue Book, that I've become a more confident water-bath canner. My goodness, how delicious my food is. Haven't gotten up the courage for a pressure canner yet, though. Dilly beans sound amazing! I might make some like fridge pickles to try. I don't have a pressure canner. Venison with gravy canned, about as good as you can get. I used a pressure cooker on salsa yesterday, it probably had enough acid what with the vinegar but I gave it a good high temperature just in case. I find myself using the pressure cooker if I add any non acidic ingredients, overkill can be a good thing. Amen and amen. I do the same thing when re-canning commercial salsa. why do you re can salsa? I don't make my own salsa (I've tried it and the kids hated it), so I buy it in commercial one-gallon sizes from a wholesale grocery, and re-can it in pint jars. Patrice, I have read your blog for more than 5 years now including going all the way back to the beginning. I also have your book the Simplicity Primer which is great... What you need to do is obtain some Mrs. Wages salsa mix and follow the directions. It is perfect salsa taste. I have been using it and canning salsa for four years now after making my own. Every one we have given jars to have raved about it. I found this out from a lady in Walmart one nite while I was buying canning jars.. Very hard to mess it up . Please try when you can. Mrs. Wages salsa mix is great. A friend of mine made and canned some then took it to a pot luck. A lady attending the potluck offered to buy all the salsa that she had canned. Wonderful stuff! It is the only salsa I can. Another good book is "So Easy to Preserve". I think it is published by the University of South Carolina extension service. It is the book that will usually be quoted when you call your extension agent.